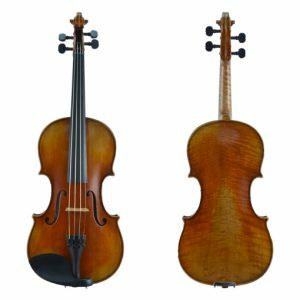 Triangle Strings is known for providing students of all experience levels with expertly setup, high quality, hand carved instruments. Each of our rental string instruments has been setup, adjusted, and maintained in our workshop by professionally trained luthiers. Graduated sizes ensure that when a student outgrows an instrument, we will exchange it for a larger one at no extra charge. While renting, Triangle Strings provides accrual of store credit instead of locking you into a “rent-to-own” contract. The professional maintenance and advice you receive as a Triangle Strings renter creates a rental experience that is unmatched. Teachers prefer our rental instruments because they are consistently setup with high quality strings, finely tuned pegs, smooth fingerboards, and professionally carved bridges and soundposts. Teachers benefit from our flexibility in chinrest offerings and appreciate the high quality student bows that pair with each instrument. Parents choose our rentals for the peace of mind that their child is playing on an insured instrument. Triangle Strings maintains and services every rental instrument at an affordable rate. Parents also appreciate the education and advice that our staff provides throughout the rental period. Ideal for the beginning to intermediate students. Includes a case with backpack straps, a brazilwood or fiberglass bow, rosin, and microfiber polish cloth. Available in 1/32 to 4/4 sizes. By submitting a reservation you are not obligated to rent an instrument, this is simply the first step. In fact we encourage all of our students to learn about and try the instrument before committing to a rental. Ideal for the beginning to intermediate students. Includes a case with backpack straps, a brazilwood or fiberglass bow, rosin, and microfiber polish cloth. Available in 12″ to 16 1/2″ sizes. Ideal for the beginning to intermediate students. Includes a case with backpack straps, a brazilwood or fiberglass bow, rosin, and microfiber polish cloth. Available in 1/10 to 4/4 sizes. Offering even more flexibility and response and thus ideal for the intermediate to advanced player. Includes a case with backpack straps, a brazilwood bow, rosin, and microfiber polish cloth. Available in 1/8 to 4/4 sizes. Offering even more flexibility and response and thus ideal for the intermediate to advanced player. Includes a case with backpack straps, a brazilwood bow, rosin, and microfiber polish cloth. Available in 15″ to 16 3/4″ sizes. Offering even more flexibility and response and thus ideal for the intermediate to advanced player. Includes a case with backpack straps, a brazilwood bow, rosin, and microfiber polish cloth. Available in 4/4 size only. Our renter’s are not locked into buying the instrument he or she is renting. Instead, Triangle Strings provides the accrual of store credit towards the purchase of ANY instrument belonging to Triangle Strings. Renters accrue Store Credit at the following rate: 100% of the first year’s rental and 60% of all additional rent plus 100% of the “Sign-Up Fee” (a yearly rental term does not require a “Sign-Up Fee”). Once a client purchases an instrument or bow, Triangle Strings provides up to 100% trade-in value towards your next instrument or bow minus any necessary reconditioning costs. We include Maintenance (or “Insurance”) in the rental fees. Bring (or ship) your instrument to Triangle Strings anytime for a “check-up” and at a minimum of 2 times per year to keep it in optimal playing condition. Maintenance includes but is not limited to: replacement of broken strings, bows, and cases as well as repairs such as closing open seams, planing the fingerboard, and adjusting the pegs. Triangle Strings requires that our workshop perform all maintenance or authorizations for maintenance. Triangle Strings charges Rental Fees automatically, each month or year, depending on the agreed upon rental term. Renter’s may update their card on file at any time during the rental period using the “My Account” section of this website. Renter’s may also view payment history and rental subscriptions in the “My Account” section. For monthly payment terms, Triangle Strings requires a nonrefundable processing fee of $45 upon signing a new rental contract. There is no processing fee for yearly rental terms.